Theft is an ugly subject but it’s one that we all have to address. If you are in the food and beverage industry, then you know some people steal. Let’s tackle five ways to help reduce (or at least find out about) theft. Be warned – some of these require SP-1! 1) Cameras – Common sense here, theft usually occurs when no one is watching. A good camera system can help reduce the opportunity to steal. They can also have the positive impact of providing much needed security for your staff and even your customers. If you want to take it to the next step, look into integrating into SP-1 so the transaction detail shows up on the camera system. 2) Require a receipt – Put it on a sign in front of the register or SP-1 that states you should be offered a receipt from the employee on every purchase. This works as a safeguard to ensure the transactions (especially cash) are being entered into the register / SP-1. 3) Pole display or Order Confirmation – This is the next level after requiring a receipt. A traditional pole display will show your customer a description of the product with the price. A more attractive way is to use an Order Confirmation monitor. Theft is reduced through the fact that the customer expects to see their total on the screen. That helps eliminate orders being pocketed. 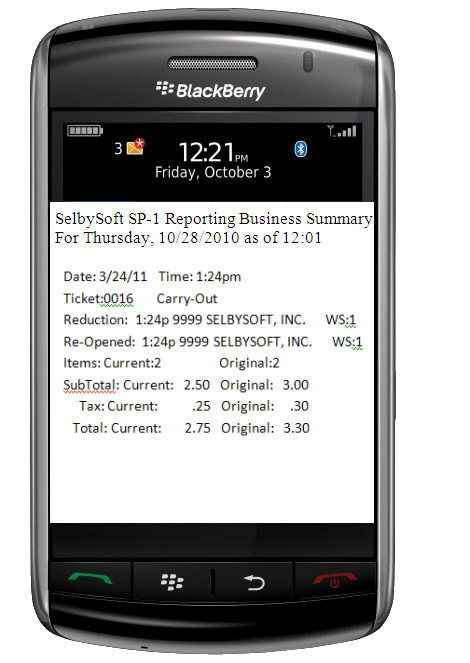 Another bonus with the SP-1 Order Confirmation monitor is that up-selling is accomplished easily and you can promote product or events. 4) Require a make or barista ticket – This is a great method for restaurants or anyone with a kitchen. Require a printed kitchen ticket for every item made. This helps eliminate employees handing out product without ringing it in. If the kitchen does not have the slip, they don’t make it. SP-1 will handle the printing to make your staff more efficient as well as cut theft. 5) Load the drawer – Here is a very low tech way to see check honesty. Throw an extra $20 bill in the drawer at the beginning of a shift. If the employee reports that they are $20 over at the end of the shift, then chances are you have some level of trust. If the employee comes out even on the drawer count, then they took the $20. 6) Multiple cash drawers – For those of you with multiple fingers in the drawer the toughest issue is what to do if the drawer is short. Who do you blame? If you have SP-1, use multiple cash drawers. SP-1 allows you to setup up to five cash drawers per station. This allows you to assign a specific employee to each drawer and still have cash accountability. 7) Fingerprint ID – Don’t forget about time theft! Some statistics show that up to 25% of all employee theft is time and wage theft! A fingerprint id eliminates the ability to clock a friend in. 8) Get rid of the punch card – Paper punches are an open invitation to theft of product. Employees will double punch for friends on a regular basis. Move to an electronic gift & loyalty and get far more value as well as a more secure system. Ours is free so chances are you will cut some costs there as well. 9) MobileDash / Audit Tracking – One of the features that we offer through our SP-1 POS is the ability to have a full audit trail on what happened. If an employee reduces a ticket after the fact (assuming they have security to do so), the audit tracking is updated and, if you are using MobileDash, an alert to your smart phone showing that the ticket was reduced. This is a fantastic way to stay on top of employees that are voiding items or tickets. There you have it, a couple ways to help get a handle on what may be going on in your location. If you have any other ideas, be sure to comment and let us know!